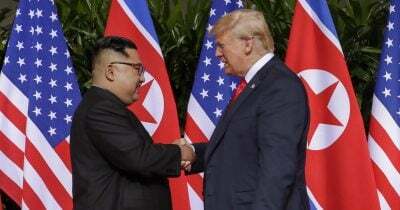 For weeks, the corporate media have been saying that the Trump-Kim summit could have only two possible results: Either Trump will walk away angrily or Kim Jong Un will trick him into a deal in which he extracts concessions from Trump but never commits to complete denuclearization. The idea that North Korea could not possibly agree to give up its nuclear weapons or its intercontinental ballistic missiles (ICBMs) has become an article of faith among the journalists covering the issue for big media. Two themes that have appeared again and again in their coverage are that the wily North Koreans are “playing” Trump and that previous administrations had also been taken by North Korea after signing agreements in good faith. But the media have gotten it all wrong. They have assumed that North Korea cannot live without nuclear weapons—without making any effort to understand North Korea’s strategy in regard to nuclear weapons. They have invariably quoted “experts” who haven’t followed North Korean thinking closely but who express the requisite hostility toward the summit and negotiating an agreement with the Kim regime. One of the few Americans who can speak with authority on North Korea’s calculus regarding nuclear weapons is Joel S. Wit, who was senior adviser to the U.S. negotiator with North Korea, Ambassador Robert L. Gallucci, from 1993 to 1995, and who from 1995 to 1999 was coordinator for the 1994 “Agreed Framework” with North Korea. More importantly, Wit also participated in a series of informal meetings with North Korean officials in 2013 about North Korea’s thinking on its nuclear weapons. At a briefing on the Trump-Kim summit last week sponsored by the website 38 North, which he started and still manages, Wit made it clear that this dismissal of North Korea’s willingness to agree to denuclearization is misguided. Kim has made major adjustments in the North Korean negotiating posture that prevailed when the 2013 meetings were held with nonofficial Americans. The North Koreans had insisted then that the United States would have to remove their troops from South Korea as part of any agreement, according to Wit. But that demand has now been dropped, as Moon told Trump in mid-April. Kim also has frozen his entire nuclear weapons and ICBM programs by suspending testing and blowing up facilities and tunnels at its nuclear test facility in front of foreign journalists in advance of negotiations with the United States. What gives the freeze far-reaching significance is the fact that North Korea still has not shown that it has mastered the reentry technology or the guidance system necessary to have a convincing deterrent capability, as Defense Secretary James Mattis observed last December. And then CIA Director Mike Pompeo agreed in January that it would take a “handful of months” for North Korea to be able to master the remaining technological challenges—but that would require additional testing. The willingness to freeze the program before it had reached its goal indicates the predominance of Kim’s diplomatic aim over North Korea’s military ambitions. Trump and Kim will be able to agree only on a broad statement of principles that reflect Pompeo’s meetings with the North Koreans, leaving significant differences remaining to be resolved in negotiations over the coming weeks. But this summit between what is surely the oddest couple in modern diplomatic history may well launch the most serious effort yet to end the U.S.-North Korean conflict. Gareth Porter is an independent investigative journalist, historian and author who has covered U.S. wars and interventions in Iraq, Pakistan, Afghanistan, Iran, Yemen and Syria since 2004 and was the 2012 winner of the Gellhorn Prize for Journalism. His most recent book is “Manufactured Crisis: The Untold Story of the Iran Nuclear Scare” (Just World Books, 2014). Featured image is from immitate.com.